Groceries already cost too much, so don't fall for these grocery store tricks designed to make you to spend more. When you first walk into the store, you'll probably see a shelf (or perhaps even a whole aisle) dedicated to sales items. Just keep walking right past it. While these items are on sale, they may not be the cheapest options. You won't know until you compare prices. If that particular cereal really is a great buy, you can stock up on it in the cereal aisle, after you've reviewed all your options. Don't assume something is on sale (or a good deal) just because it's on an endcap (those shelves tacked on to the ends of aisles). Sometimes manufacturers pay to have their latest products placed there. 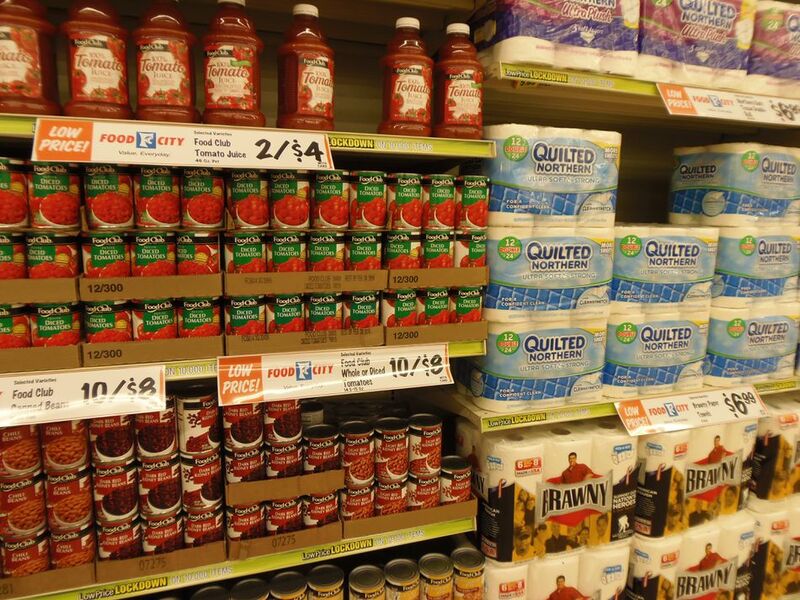 If something catches your eye, make a note of it, and compare prices when you get to the right aisle. Buy tortillas on the Mexican aisle, and you'll pay one price. Buy them in the refrigerated section, and you'll pay a different price. And the same is true of cheese (usually cheaper in the dairy section, than the deli), bread (usually cheaper on the bread aisle, than the bakery), salsa (usually cheaper on the Mexican aisle, than the chip aisle) and a host of other items. If you see a product in more than one place, check the price tags, and shop from the cheapest spot. Want to get the best price on everything you buy? Then, be sure to look high and low. Grocery stores usually place the most expensive products at eye level, where they're easiest to spot, and it's common for big name manufacturers to pay a premium to have their products placed in this high-earning spot. That's great for them, but not for you. Run into the grocery store for bread, produce and milk, and you'll probably have to walk the entire store to get them – no accident I assure you. Grocery stores are designed to put as many temptations in your path as possible – chips, cookies, baked goods, soda. By the time you get the stuff you came in for, your cart is full of all sorts of other junk. Avoid this pitfall by skipping the aisles all together, and only shopping with a hand cart or no cart at all. You'll be less inclined to tack on a bunch of extras, if you have to lug them from one end of the store to the other. Grocery carts keep getting bigger because they want you to have room to buy more. Don't fall for this bit of trickery. Leave when you've bought everything on your list – not when you've filled your cart. Dried beans used to be located next to the canned beans, but now more and more grocery stores are separating similar items to make it harder for you to compare prices – and even more devious – they're placing the most expensive item first. Don't let this get in the way of your good deal. Consider all your options. Then, go with the cheapest one (not the first one you come to). 10 for $10 deals and BOGO sales make it sound like you have to buy a certain number of items to get the deal, but often that isn't the case. Find out how your store handles volume pricing (whether you have to buy the quantity mentioned to get the deal, or whether you can buy less). Then, shop accordingly. Buying just what you need may sound like a great way to save money, but it rarely is in the produce department. Pick out a few loose fruits or veggies from the bins, and you'll probably pay as much as you would for an entire bag (maybe more). That's because the largest fruits and vegetables usually end up in the bins, and when you're paying by the pound, that can add up in a hurry. Usually buying in bulk saves you money, but not always. Before you reach for the biggest package of something, check the unit pricing to see if it really is the best deal. Sometimes the smaller package is the better deal right off the shelf, or it becomes the better deal after you throw a coupon into the mix. If you need a pound of meat for a recipe, dig through the meat packages until you find the one that comes closest to a pound. Package weights can vary widely, and that 1.25 lb package will cost you quite a bit more. Don't be surprised if the smallest packages always seem to be at the bottom of the pile.